SPOUTNIK is a revolutionary compact freestanding microwave. Its unique innovative domed design is compact on the outside whilst being spacious on the inside. Being very versatile the design gives you a 360 panoramic vision helping you keep control of what you are cooking. Featuring an electronic LCD display control panel, the cooking mode is selected from four separate options. The translucid top lid has a smooth opening system so the internal cooking area is completely accessible, which helps to make it faster and easier to clean than traditional microwaves. The Feestanding Microwave is an exciting new microwave with an innovative domed design and illuminated turntable. It is also versatile for its size, and its unique spherical shape and spacious interior can accommodate a wide range of dishes. 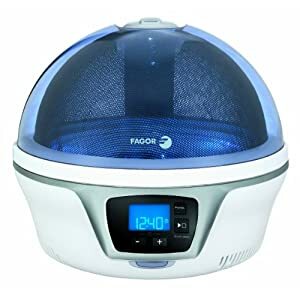 Spherical shape, 360 degree panoramic vision, assisted, innovative domed opening 65 degrees, 28cm illuminated turntable, 4 power levels:re-heat,high temperature 700w,low temperature 500w and defrost.